Nice to hear that initial impressions are mostly favorable with regards to the quality, shape and spaciousness. "none of the pictures I have seen here or elsewhere show a good taut pitch with doors or other panels looking a little flappy." Indeed there are some painful pictures to look at. Hopefully the one above shows a better side to the tent. Most of poor pitches I've seen are due to a lack of tension around the base of the shelter. In short what is happening is that the rectangle isn't that tight, so when the poles are added it gets lifted up and that pulls the four corners closer together, so the sides become loose. It's important to stake out an accurate rectangle AND to have some tension on that rectangle. In the YouTube video where I pitch it, you can see at 1:15 that I'm pulling it taut when I insert that last stake. Alternatively, you could also stake it out loosely, fine tune to the stake locations, and then snug the rectangle up with the tensioners before adding the poles. How this affects the geometry is hard to explain, but if the rectangle isn't taut when the poles are added then it causes looseness in the middle of the sides because it is lifting the rectangle up (and thus drawing the four corners closer together). Consider a single pole pyramid (e.g. 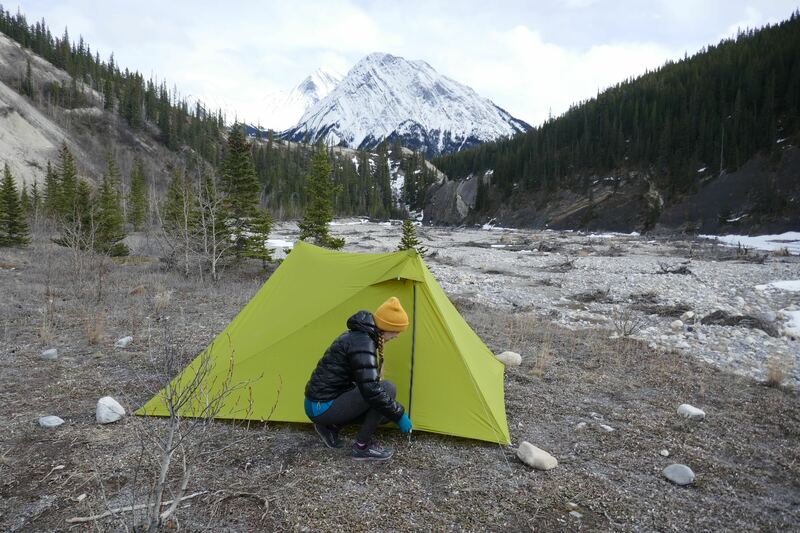 MLD DuoMid) - the simplest rectangle based tent. It has a rectangle base of course and if you look halfway up the tent there is still a rectangle (formed by the four corner seams) but now it is a much smaller rectangle at this height. Imagine that you staked it out in a rectangle with the angles correct (90 degress) but the whole rectangle was much too small (e.g. you weren't pulling the sides tight when you staked it). If you then inserted the pole and kept extending it, eventually you would get it tight along the four corners seams but the sides will never be tight because they are a fixed length which only pulls tight when the corners are the correct distance apart. In this case even when the corners pull tight the sides will still be too short. Similarly, if you want to pitch a DuoMid with large gap below the fly, you wouldn't stake it out in the same size of rectangle but with slack in the cord. Rather, you would stake it out in a tight but larger rectangle so that when the poles are extended and the shelter lifts off the ground, it is pulled to its natural size of rectangle. The same is true here in the sense that it is a rectangle based tent, so if it's not staked out tightly and the rectangle lifts off the ground then it is oversized relative to what it should be at that height. 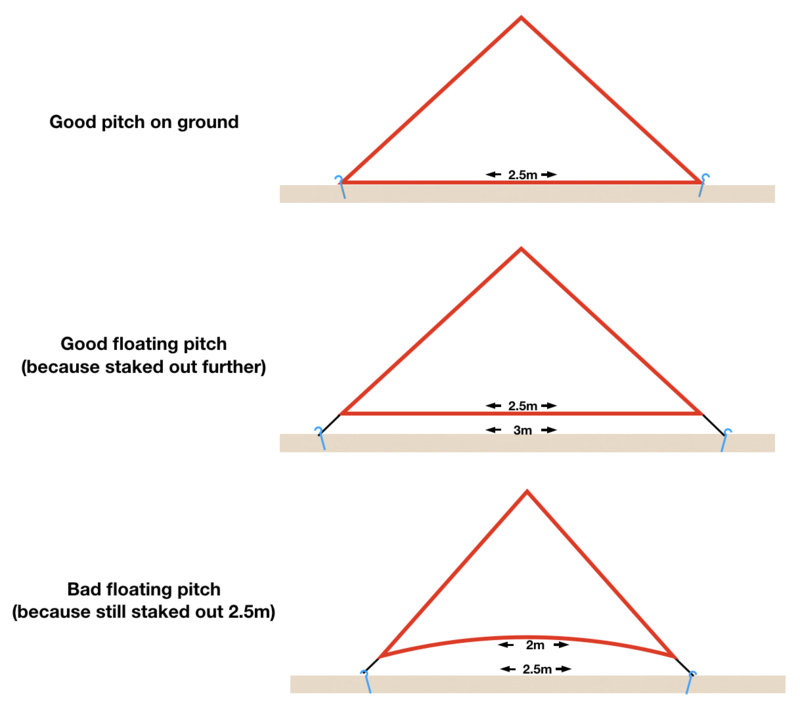 To be clear, you can do a floating pitch, you just need to stake it out in a larger rectangle rather than having less tension so it lifts more. So to get to the point, if someone is having trouble with getting the sides taut, then instead of having the poles as tall, have them a bit shorter and tighten it up more at the corners. I prefer to tighten up the rectangle snug before I add the poles. Doing this, the poles naturally max out at about 118cm with a good pitch (see video). If your rectangle is less tight then your poles can extend taller to pull it taut but then the sides aren't tight. So if you have a somewhat loose rectangle it's best to limit the poles to 117 - 119cm and then snug it up at the corners rather than extending the poles even taller to add that tension. Yet another option is to use the additional stake out points to "eyebrow" the sides per MLD. That's more of a stop-gap solution but you could also do this on purpose if you wanted more airflow. As Padowan said, it's best to spend your time getting that 4 stake rectangle perfect. If you get the rectangle perfect and have some tension on it, then the pitch should look good when you add the poles without needing guylines, perimeter stakes etc. Everything else you might add should be to beef it up, not to fix a wonky pitch. Here is a video of me getting a good looking pitch per the above technique. "My only criticism thus far is that the cordage on the corner linelocs is too short and will need replacing.....Dan had spec'd the guy outs at 20cm which gives you enough leeway for peg placement. The guy outs on mine are only just over 10cm." My experience has been that the factory has been quite consistent with these cords. Are yours is precisely 10cm? Or were you speaking more generally and meaning they're more like 10cm than 20cm? I will pay attention to this in case it needs to be addressed from a QC perspective. You should be able to use that extra hank of cord that is included to create longer ones. "The pole grommets are a touch large in diameter for my poles which causes the tip to press visibly into the fabric, so take care on your first pitch and check this." "As stated, the pole grommets definitely not optimal for a standard pole tip. I'd be bothered about that. The main bugbear I'd have. That and the reinforcement fabric cap are the only part which looks a bit weak/poor spec"
I'm certainly interested to hear more here. Particularly whether the concerns are the grommet diameter, the placement of the grommet or the quality of the grommet. I suspect it is the placement since I think the diameter and quality are pretty standard. The inner diameter is 7.5mm which I think is pretty standard. I tried a lot of different poles in these and found that trekking pole tips are all over the place (e.g. Fizan poles are way longer than Locus Gear). It sure would be nice if these were more standard. I didn't want to go larger diameter than this because some poles insert pretty far as is, but I also didn't want to go smaller because some tips barely fit in far enough to feel secure. As I said, I think this diameter is pretty standard. What is perhaps less standard is height of the grommet, in the sense that it is placed pretty high (close to the peak of the tent). I wanted the grommets to be fairly high partly because the closer they are to the true peak where the main lines of tension meet, the more solid it will be, but also because having them higher gets them out of the way if someone one wants to pitch it with the handles up instead. In testing I did notice that some of the slimmer/longer tips could push on the canopy enough to be visible externally as small dimple, so I investigated this pretty extensively to see if it would lead to problems. In most of my field testing I used the poles with the longest tips and while you could see where it was touching the top, virtually all of the pressure was still on the grommet so I couldn't cause any damage. I further set it up a windy area again with the longest tip I had for over a month to see if any damage could slowly accrue but the best I could do was mild scuffing on the PU coating inside the 210D nylon (which is not part of the waterproofing) and no damage to the nylon itself. Partly this is because the pressure isn't substantial since the grommet was taking virtually all of it, but also because the grommet is so close by than it holds the pole precisely in place so it's not rubbing back and forth. So longer tips can touch but will barely push and not rub. Certainly pole tips vary a lot though so there may be longer/slimmer tips out there that don't work with the current size/placement of the grommet, but if the tip is just pressing lightly then I don't think it will lead to any problems. Unless it looks like it's really pushing, I'd just keep an eye on it and I think you'll find it's not causing any damage. Also, just to be clear this is only the case with longer pole tips. Shorter tips like those on my Locus Gear poles don't touch at all. Hypothetically, if the tip were to truly cause damage and wear through the tent, this would put a hole in the tent (obviously not great) but it wouldn't be a structural failure in the sense that the grommet is still there and would be taking the force, so the tent isn't going to collapse. The worse case scenario is that the tent springs a leak. If you think your pole tips are on the longer side of things, it might be prudent to see if you have shorter ones or keep an eye on it for damage. I think most pole tips won't push and any that do would be pushing lightly enough that it's not a problem, but if you get any damage beyond scuffing of the PU coating then get in touch with me/Massdrop and we'll sort it out. I expect you could spot this happening long before the point of failure, unless your tips are much longer than any I've encountered. With regards to the reinforcement cap itself, this is 210D nylon. Other brands like TarpTent are using more of a rubbery material (PVC coated polyester I believe). I didn't opt for that because I used to own a Locus Gear Khufu that used this and I found that it strained some of the stitching because it had a less stretch than the fly material. The nylon used in the X-Mid peaks has slightly more stretch than the 20D polyester fly, so it doesn't create problems with concentrating stress like something with less stretch can. The main goal with this is abrasion resistance, so something with similar or more stretch works best for that. As I mentioned above, I would be pretty surprised if someone could substantially damage this with a normal pole tip because there is so little pressure and the 210D nylon is pretty tough. On hindsight though, I can see how someone could sleep better at night if the grommet was a bit lower and you didn't have to worry about it touching the 210D nylon at all. I'll keep this in mind for future runs and will likely move it a bit lower. "The mid tie points are just a simple loop of grossgrain. This is fine for a low pitch, but a lineloc or even a simple bungee would add some flexibility, and the possibility to raise up the mid point a bit for a nice through blast. I'll probably start with some bungee on those." "A small piece of bungee on the outer door tie up would be useful to have to allow the door to be held up when the mid point along that edge is pegged down. At present the tie up is too short when the door's pegged in the middle." For both of these it was question of whether it was worth adding weight for functionality that I suspect most folks would rarely use. The mid-tie points on the long sides are useful in a snowfall or high winds, whereas I pretty much never use the mid tie outs on the end walls. Indeed a bit of cord/bungee on these would be desired if you want to use them regularly. For the door, I am aware that you can't use the outer door tie up if you also have staked down the bottom edge of the door on that side. My thinking was that if it was windy enough that you want these optional stakes, then you probably don't want to be hanging around with that door open. Or if you do want a door open, then you'd could use the other doorway on the lee side of the tent. So I thought about this, but figured it was a rare enough use case that it was best not to add a few grams. But if someone did want this functionality they could extend the loop the door connects to with some extra cord. ZenTrekker, Toby, cathyjc and 19 others like this. @dandurston that's a cracking response and the kind of detail that sets you and your shelters apart from many others. Tartanferret, Charles42, jack4allfriends and 5 others like this. Nice measured responses and detailed explanations. Jamess, theoctagon and FOX160 like this. Thanks for the detailed response Dan, and this"...but also because having them higher gets them out of the way if someone one wants to pitch it with the handles up instead'. That is me Dan. I was the person posing you this question all those (9) months ago. "Would it work tips down?" I bought this in the first drop on the first day based on it's ability to do this. Don't change it. Why does everyone want tips up? I love this feature on my Duplex. Do I easily push the grosgrain out of the way Dan and insert the handle into the pocket or does it sit against the grosgrain loop-I'm asking because I am still waiting for mine and can't look for myself. Thanks. Thanks Dan...although you didn't address the comments on maybe having a slightly heavier-duty floor. I don't use a ground sheet (never seen the need with my Duplex). What are the longevity comparisons between the 20D on the XMid and the 1.0 DCF floor of the Duplex of SS Li, or other comparable tents with silnylon floors. @James Not sure if you understood me, every picture i've seen the pegs have been off their centre line & pulling one side over & collapsing the other side, a un-taut pitch that will fail in bad conditions imo. To get that pitch right you can float it as high as you want but I don't think the height of the pitch will change the tautness if the pegs aren't placed right. Could be wrong as I don't have one to play with. edit: Am maybe rambling, sorry . I quite like it, I like the way 2 pegs deal with 1 seam a piece while the other 2 deal with 2 seams a piece & that its neither symmetrical from the centre of the width or length. Whens that solid inner coming! Not Dan I know but I have the Duplex also DuneElliot and sometimes on really rocky gravelly earth I will use a bit of Polycryo at about 40 grams. That could work for the X mid also perhaps. I have a Big Sky Revelation with I believe the same 20D flooring and it is tough so I feel (hope) the Xmid will be up to it's standard. "What are the longevity comparisons between the 20D on the XMid and the 1.0 DCF floor of the Duplex of SS Li, or other comparable tents with silnylon floors." Sorry yeah I missed this one. The durability of a floor comes down to 3 main properties of the material which are tear strength, puncture resistance, and abrasion resistance. Normally tear strength isn't as important for a floor because it sees a lot less forces than the fly does, and puncture resistance is something that shouldn't be a big concern if your reasonably inspecting your campsite for sharp sticks, thorns etc. So it varies but generally abrasion resistance is the main one (e.g. what happens when a rock is rubbing on the bottom?). The main advantages of poly over nylon are the lack of sag (water expansion) when wet, and the UV resistance, but neither of these matter much for a floor. The main advantage of nylon is higher tear strength but my research is that this is often over stated as the difference is actually about 15-20% and nylon loses 10% of that when wet. If everything else was the same (thread count, calendaring, ripstop, denier etc) then nylon would be slightly stronger in tear strength and about the same in puncture resistance and abrasion resistance. Puncture resistance comes down to the weave more than anything else, while abrasion resistance is inconclusive with some technical reports giving the advantage to poly while others to nylon. All that is to say that a 20D poly floor is likely to be quite similar in durability to a 20D nylon floor. DCF is really good at tear strength but even the thicker versions (1.0oz) aren't particularly great for puncture resistance since the dyneema is not woven, nor are they great at abrasion resistance. It would be top of the pile for tear strength, but my judgement is that 1.0oz DCF is below 30D nylon and 20D poly for puncture resistance and abrasion resistance. So basically I would say the longevity of the X-Mid floor is intermediate between 1.0oz DCF and typical silnylon (30D). It's something that you could damage on sharp gravel, but could also last a very long time if it's used in good conditions. For most folks I don't recommend a groundsheet but if you do a fair bit of camping on rock then one may be wise. Mole, FOX160, theoctagon and 3 others like this. Phew! Just arrived. Too late to put up tonight. jack4allfriends, theoctagon, Chiseller and 3 others like this. It looks as if you've got a yard and plenty of plant pots to stand on the tie outs - where's the problem? theoctagon and Shewie like this. I'm working on another pitching video that I should have out in a couple days that explains everything better, but I'll leave one more note on pitching here. 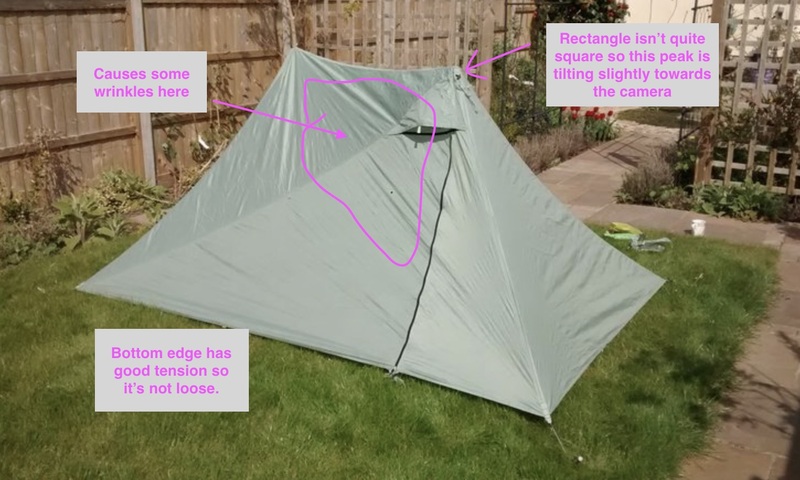 The method shown in my original video involves putting a nice bit of tension on the rectangle base of the tent before the poles are added (which isn't emphasized in that video). Doing it this way, (1) naturally limits the poles to the correct height and (2) you still have enough tension on the sides of the tent even after the poles pull the corners inwards, which reduces tension along the sides. Basically, you start with high tension around the base so that once the poles are added there is still sufficient tension along the sides. If the tension around the base isn't tight when you add the poles, the poles will extend too tall when you snug them up to pull the whole shelter tight. That harms the angles because it pulls the rectangle smaller but taller, and since it pulls the rectangle smaller the sides become loose. An alternate method to achieving the same thing is to have the base staked casually (modest tension), then insert your poles without extending them too far (you could measure), and then snug it up at the corners after the poles are added, rather than continuing to extend the poles until the shelter is tight. So you would insert the poles only until the fabric is slightly tight, and then really crank the shelter taut by at tightening the corners. This also avoids a situation where the corners are pulled in and the sides become loose. Simply put, if you have minimal outward tension (around the rectangle) but a lot of upward tension (via tall poles) that going to give you loose sides. None of this is unique to the X-Mid. The same principles are at play with a single pole mid. If you're already pitched the tent and notice the sides are loose, rather than trying to compensate with extra stakes and guylines, the solution is to lower the poles (e.g. 10cm) and then snug it up at the corners. This pulls the corners out and thus the sides get longer/tighter. Note that none of this affects the ability to float the fly. If you want a floating fly, stake out a larger rectangle (via longer cord at the corners) and vice versa for a lower fly. The size of the rectangle determines the degree of floating. With any size of rectangle, you can use either of the methods described above. If you have a larger rectangle, you can also have taller poles and still have a good pitch because the angles are right. 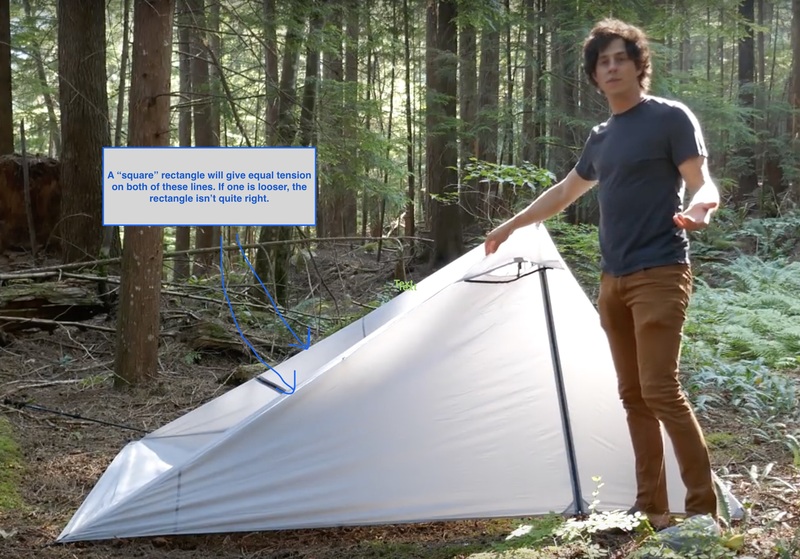 You've preserved the correct ratio between the height and base area of the tent. The poles should end up around 118cm normally (e.g. 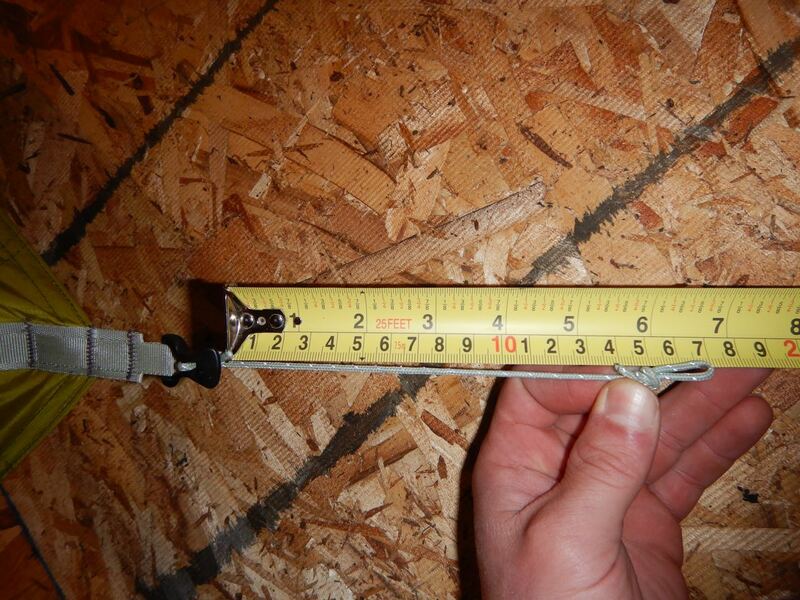 5-7cm bottom gap) and only get above 120cm if you've staked a larger rectangle. I should also mention that there is only so much adjustability for loosening the inner so it doesn't lift off the ground if you opt for a high fly. The tent is designed to work with a gap from 0 to about 13cm. If you want it substantially higher than this (15 - 30cm) then the inner will start to lift off the ground and then the floor effectively becomes smaller. If you want to pitch it this high without losing floor area, then you'd have to extend the webbing where the inner connects to the fly so that you can loosen it off even more. gixer, Robert P, Shewie and 3 others like this. I am more envious each passing day-mine left NY a week ago not sighted since. Probably wearing a lei doing a hula in Hawaii having a grand old time. I will do a trial pitch tomorrow. However, I did unpack it and I’m impressed with the build quality. It looks very well put together. I did weigh it too. Inner 281g, fly 543g, total 824g , stuff sack 14, pegs (8) 68g. Not exactly a thrilling video but I thought a few people might be interested in seeing some more clips of one. The tent seems very well thought out, tons of room and it looks to be very well made. There's a slim chance I can get out and use it tomorrow but if not then it should be next week hopefully. FOX160, jack4allfriends, Padowan and 16 others like this. That's awesome. Nice to see a good looking pitch! Great job on the video too. FOX160, Robin, Lamont-Cranston and 1 other person like this. Looking forward to the video Dan as I intend to frequently (mostly probably) pitch with the fly at least a few centimetres of the ground. Good to see theoctagon follow your outlined method and get an excellent pitch. "I like the way 2 pegs deal with 1 seam a piece while the other 2 deal with 2 seams a piece & that its neither symmetrical from the centre of the width or length"
It's interesting to ponder the symmetry of it because it's not symmetrical in the normal sense, and yet there seems to be something symmetrical about it because both side of the tent are the same. Normally when we think of symmetry we think of "reflectional symmetry" where you could draw a line across it and if you folded it on that line both sides would be the same. The X-Mid doesn't have that, but it does have "rotational symmetry", which means that if you drew a line through the center you could rotate one half 180 degrees and it would match the other half. Some tents only have reflectional symmetry (e.g. any tent with 1 door), while many have both rotational and reflectional (e.g. more two door tents). It's uncommon for a tent to only have reflectional symmetry like the X-Mid but there are others. "Do I easily push the grosgrain out of the way Dan and insert the handle into the pocket or does it sit against the grosgrain loop"
The grosgrain is high enough that you can just insert the pole handle against it. fluffkitten, gixer, theoctagon and 1 other person like this. Ah ha Dan, thanks for that, does the handle not slide around? Should I not be concerned if the handle slips and ends up sitting in the pocket? I quite like the Mustard coloured one in your picture @dandurston will that be an option to buy? "Does the handle not slide around? Should I not be concerned if the handle slips and ends up sitting in the pocket?" The peaks of the tents are peak shaped, so the pole will naturally sit at the highest point. It is possible that in severe weather that the tent could be jostled enough to dislodge a pole (as with any trekking pole tent), so using the grommet provides a bit more security. But basically the pole shouldn't slide around if you have a tight pitch because it anywhere it might slide too would be lower. "I quite like the Mustard coloured one in your picture @@dandurston will that be an option to buy?" That's an older prototype built from a color the factory just happened to have on hand. So no there's no plans to offer that color for the foreseeable future. But down the road I would like to offer two color options with a steath one for folks that prefer that and then a brighter color. So plausibly this could be the brighter color but my wife doesn't like it, so probably not. I haven't put much thought into brighter colors, but we might be able to add one for the next production run ready in spring 2020. Dave V and Lamont-Cranston like this.